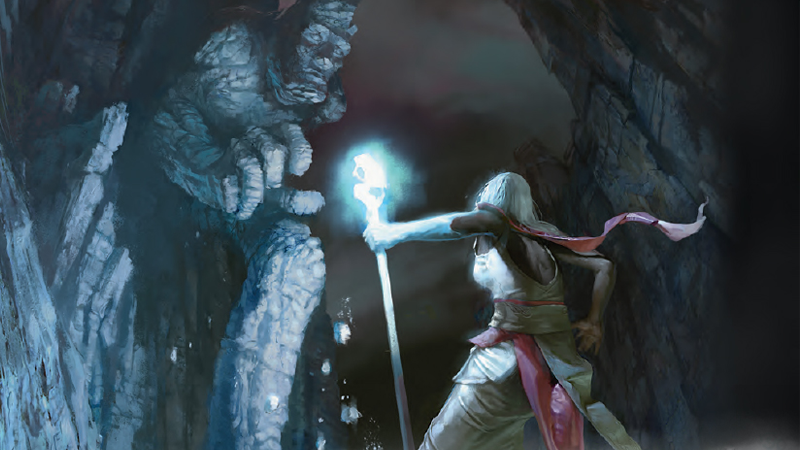 The monsters your Dungeons & Dragons group face are getting a little bigger with Storm King’s Thunder, a new adventure being released next week—and we’ve got an exclusive look inside at all the new locations, rules, and monsters you’ll find. I hope your bag of holding is large enough to pilfer the plus-sized loot a Frost Giant might drop. Designed for characters from Level 1 to 11 and up, Storm King’s Thunder sees the titular Storm King Hekaton mysteriously absent from the Forgotten Realms, leaving the Giant races he usually holds in check free to unleash an invasion across the realm. With Frost Giants raiding the Sword Coast, the cities of the Cloud Giants appearing above Baldur’s Gate, and Fire Giants assaulting the deserts, the small folk of Faerun have to band together before they’re all crushed beneath the heel of the Giant races... both figuratively and literally. The Storm King’s Thunder adventure guide comes with everything a budding Dungeon Master needs to create a new campaign within the story of the Giant invasion, as well as details on a new type of loot that players can find in their adventures to use against their large foes. These include items imbued with the Giant’s own Rune magic, a powerful enchantment the Giants used to fight dragons. Ahead of the adventure’s launch next week, we’ve got an exclusive gallery featuring some of the pages you’ll find in the Adventure guide, making their debut here on io9. Don’t forget to click the magnifying glass to enlarged the images! Rune magic is an ancient practice that allows giants, and anyone else who masters the runes of power, to grant magical properties to an object by scribing a rune on to it. Triboar is a market for the horses raised by nearby ranches. Blacksmiths, harness-makers, and wagon-works also flourish in town. Nearly half of Triboar’s population lives outside the town proper on sprawling ranches and neighboring farmsteads. Although Northlanders are often referred to as barbarians, not all of them fit this description. Many once-feared tribes have become merchants whose bartering skills are equal to or better than the warlike talents of their ancestors, such that many a Northlander merchant earns more booty than their raiding neighbors. The Savage Frontier, or the North, serves as the background for Storm King’s Thunder. Players must traverse vast and varied swaths of land to advance their quest to thwart the giants. The frost giant greatships roam the icy northern reaches of the Sea of Moving Ice in search of a powerful ancient artifact said to pose a terrible threat to the small folk. In Storm King’s Thunder, players can gain access to a clandestine network of teleportation circles to access distant lands nearly instantaneously. Harshnag the Grim, a formidable frost giant who roams the North, wishes to restore the shattered ordning and seeks out adventurers who share his goal. On the lower deck of an airship, a magically bound air elemental powers a propeller, allowing characters to control the thrust and direction while flying or gliding across the tundra. Hill giants have been ransacking nearby villages and snatching up and eating folk who didn’t run fast enough. So far, their activity has been confined, but as food becomes scarce the hill giants will be forced to expand their efforts outward. Far to the east, a xenophobic clan of stone giants works to destroy what they have come to fear and abhor—the rapidly spreading civilizations of humans and their ilk. Storm King’s Thunder introduces new monsters that players will encounter in the Forgotten Realms and provides optional actions and traits for giants. Storm King’s Thunder will be available from September 6th, for $50. You can find out more information about the adventure at the D&D website.